There was once a cake I enjoyed time and again, back in the day in Jakarta, and if memory serves me well, it was at least 5 times that this wonderful cake made its way into our many family celebrations. 5? Just 5? Actually, 5 is a lot ... considering the sheer number of home bakeries and commercial bakeries we would get our cakes from. And believe me when I say we were spoilt for choice. Now what I'm talking about is the Chocolate Banana cake from Awfully Chocolate. This cake was so good ... but dang! so am I ... who managed to recreate it for G's birthday a few years back. 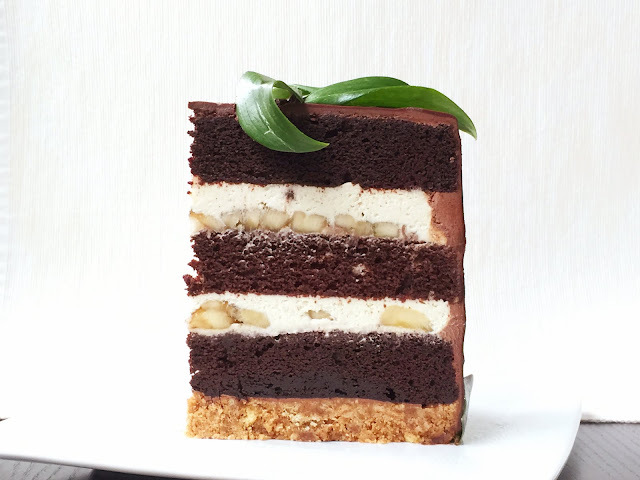 Rich and dark chocolate cake layers sandwiched with a creamy chocolate vla filling, with smooth and sweet sliced bananas in it. Yummy! If I previously said he's nuts about nuts, he's also bananas for bananas. And after a long spell, it's about time! So for the nth time, we used our favorite Devil's Food Cake recipe. And where we previously used buttercream or custard to sandwich the layers together, I upped it with creme mousseline, not 'just because', but the laws of physics demanded it. We needed a butter based concoction sturdy enough to hold up our three massive layers of deep dark chocolatey goodness. 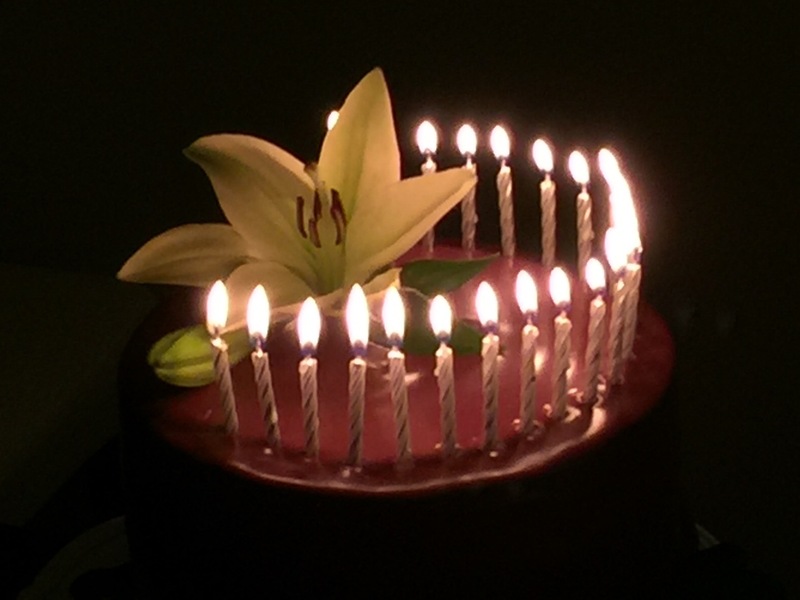 The client's brief was: chocolate cake, and decorate it as simply as it could possibly be. Client being the husband. LOL. Chocolate cake ... check! Simple ... check! It will be an antithesis of the extravagance last week. The night before D-day, or A-day (psst ... anniversary), I had a lightbulb moment. What if the cake had a crust? Oh wow! Decadent, smooth, creamy and now ... crunchy too! It would be amazing. And it was! Since we were going across the border, Joy made the crust and assembled the cake. 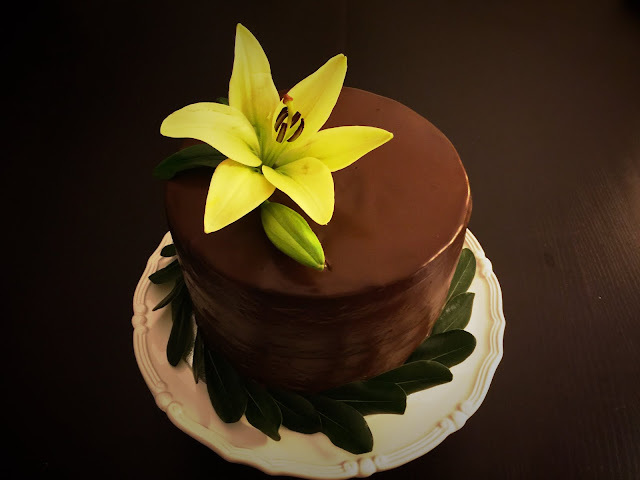 Upon my arrival, or rather, the arrival of the single origin Ecuadorian chocolate, we made the ganache and decorated it. Tadaa! Don't be daunted by the numerous subheadings, this can easily be broken down into parts that you could undertake over the course of a few days. ... this will be a very tall 3 layer 9 inch cake! Cake can be baked, then wrapped tightly with Saran wrap when warm, then frozen. When removing it from the freezer, unwrap, and place, covered with a tea towel, on a cooling rack, to avoid a soggy cake. This cake, and most cakes, for that matter, can be prepared up to a week before using. 1. Adjust the oven rack to the center. Preheat to 350 degrees. 2. Butter 3 9-inch cake pans and line the bottoms with parchment paper. 3. Sift together the cocoa powder, cake flour, salt, baking soda, and baking powder in a small bowl. 4. In a large bowl, beat together the butter and sugar until smooth and creamy. 5. Add the eggs one at a time until fully mixed in. 6. Mix together the coffee, liqueur and milk. 7. With a spatula or wooden spoon, stir half of the dry ingredients into the butter mixture. 10. Divide the batter into the 3 prepared cake pans, place all 3 in the center rack and bake for 25-30 minutes, or until it passes the toothpick test. 11. Cool in the pan for 10 minutes. 12. Run a knife along the edges to release the cake from the sides of the pan. Invert it gently onto a cooling rack and allow to cool completely. Boil water and sugar and when cool, add liqueurs. Brush on cake when cake cools. Mix all the ingredients in a food processor, then bake in a greased springform pan for 7-10 minutes in a preheated oven set at 350F. Remove when cooled completely. ... recipe here, can be prepared up to two days before using, refrigerated. You'll want to whip it up a bit in the stand mixer to be of spreadable consistency. ... recipe here, can be prepared up to a week before using, refrigerated. Heat the cream in a saucepan until just almost boiling, then carefully transfer the chocolate shards into the saucepan, whisking vigorously until the ganache becomes a smooth homogenous consistency. When warm, transfer to a pouring vessel. You'll need 6 to 8 bananas, sliced, for this. The more, the better! 2. Place the crust on the (exact sized) cake board, then stick a layer of chocolate cake on it with a dollop of ganache. 3. Arrange the sliced bananas on this layer, 1/2 an inch from the edge of the cake, overlapping, working your way into the center. 4. Scoop half of the creme mousseline on to the bananas, taking care not to undo the amazing design you painstakingly made. 5. Another layer of cake. 6. Repeat with more bananas and more creme mousseline. 7. The most level of them all ... cake, that is, goes on the top. 8. Poke 3 skewers in it, if you must, to keep it from sliding all over the place. Told ya the cake was going to be tall! 9. Refrigerate for an hour or so. Skip this step if you're in a hurry. I just like to set the filling a bit more before icing the cake. 10. Frost with the Italian buttercream. 11. Refrigerate for an hour or so. Please do not skip this one, unless your guests are knocking on the door. If I have space, I chuck the cake in the freezer, no kidding. Only to set the buttercream. After all, a warm ganache is going on it. 12. Check that the ganache is of pouring consistency. If too cold, place in a warm bath, submerging up to half the container, stirring until you're happy with the drip. If too warm, place in the freezer, checking every minute. 13. Haul this big cake carefully on top of a cooling rack, which is sitting on top of a parchment lined baking sheet. Why? Because you want to be able to pour all that expensive chocolate back into a jar where you can enjoy it in the near future. What better option than collecting it on top of a parchment? 14. Pour the ganache on top of the cake, covering the sides completely (or not). 15. See all that on the bottom? Have it with your ice cream tomorrow. 16. If you can haul this whole setup back into the fridge, do so. Otherwise, let dry in a cool place until it sets a bit. 17. Stick the biggest and most beautiful lily you can buy on it, unless you are an amazing sugar crafter and can produce it from scratch. 18. Line the bottom with the leaves and restrain yourself with the decor. The client wanted simple, remember? Without a doubt, the best cake of 2015! Woot!